Telesis Marking System News - updated 12/01/2016 - Featuring TMP1700 is a flexible pneumatic single pin marker for applications which require in-line integration, bench top or portable configuration. Telesis Laser Marking & Vision Solution! Unpack, Play & Mark with the BenchMark®460! 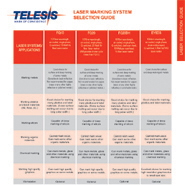 Telesis offers a full line of laser marking solutions. These laser systems cover the spectrum of wavelengths enabling applications for a wide range of products, from medical devices and instruments to automotive components, delicate plastics, ceramics, glass and airframe components. We can mark virtually any material with text, bar codes, logos and graphics. This is Telesis. This is what we do. Telesis BenchMark�® 460 on the BBC News! You Mark It, You Get It Back! Telesis is so proud to have made it to the BBC news with the BenchMark® 460 hand-held marker. We can't prevent theft, but we can surely help you to get it back! The BenchMark® 460 is a lightweight portable dot peen marking system, easy to use and therefore perfectly suited to this job. Select more info and check out the video. With the NOMAD 4000 marking system, Telesis were able to meet the requirements of the client, especially when we could give them a reference from within their own organization. The factories of Hunting PLC (Hunting Energy services) in The Netherlands as well in the UK have been using Telesis marking systems successfully for over fifteen years. Telesis FQ2H Dual Head Fiber Lasers offer the unique advantage of controlling two independent marking heads with a single integrated controller. The wattages of the laser heads can be mixed and matched. Thanks to the Telesis FQ2H laser marking system you double the marking speed and throughput!